Historia del antimormonismo en los Estados Unidos. Artículo de un diario de 1954 en el que se compara a José Smith con el profeta Mahoma. “Mencionando un autentico retrato de José Smith—el Mahoma—el Review comenta: ‘Nunca vimos una cara en la que la mano del Cielo haya escrito de manera más legible bandido’. La cara era un índice fiel del carácter”. Schoppe, Amalie.Der Prophet: Historischer Roman aus der Neuzeit Nord-Amerikas(3 vols., Jena, Alemania, 1846). Marryat, Frederick.Monsieur Violet: His Travels and Adventures Among the Snake Indians and Wild Tribes of the Great Western Prairies (Leipzig, 1843; London, 1849). Russell, John.The Mormoness; or, The Trials of Mary Maverick(Alton, Illinois, 1853). Richards, Robert.The Californian Crusoe; or, The Lost Treasure Found: A Tale of Mormonism(London and New York, 1854). Bell, Alfreda Eva.Boadicea, The Mormon Wife: Life-Scenes in Utah. (Baltimore, 1855). Ilustración del libro The Prophets, or Mormonism Unvailed, de Belisle. 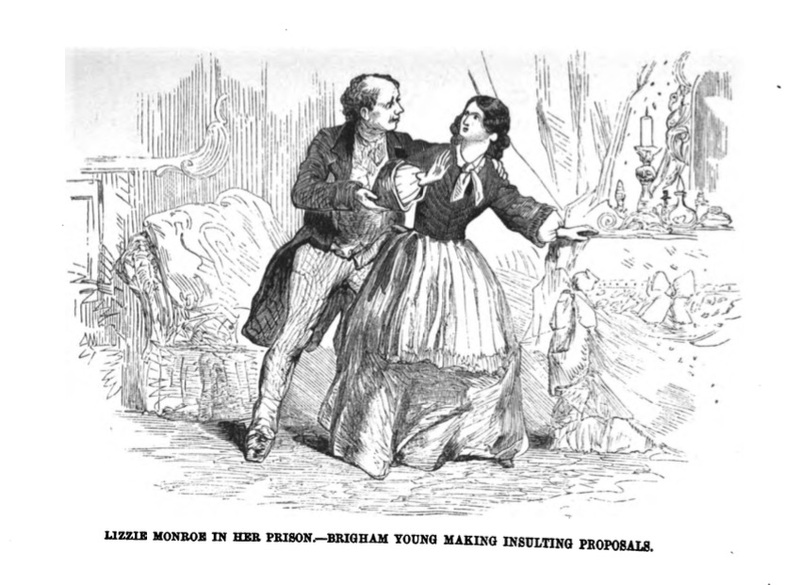 El subtítulo de la imagen dice "Monroe en su prisión--Brigham Young haciendo propuestas insultantes"
Ward, Maria.Female Life Among thte Mormons: A Narrative of Many Years' Personal Experience. By the Wife of a Mormon Elder Recently from Utah(New York, 1855). Conybeare, Vlilliam John.Perversion; or, the Causes and Consequences of Infidelity: A Tale for the Times(3 vols, London, 1856; New York, 1856). Ward, Maria. The Husband in Utah(New York, 1857). Fuller, Metta Victoria.Mormon Wives: A Narrative of Facts Stranger than Fiction(New York, 1856, 1858). Duplessis, Paul. Les Mormons(Paris, 1858). St. John, Percy Bolingbroke. Jessie, The Mormon's Daughter: A Tale of English and American Life(3 vols., London, 1861). Reid, Captain Mayne. The Wild Huntress(3 vols., London, 1861; New York, 1861). Winthrop, Theodore. John Brent(New York, 1861). Aiken, Albert W. Eagle Plume, The White Avenger: A Tale of the Mormon Trail (New York, 1870). Saved from the Mormons (New York, 1872). Mitchell, Langdon E. Two Mormons from Muddlety: Love in the Backwoods(New York, 1876). Aiken, Albert W. Gold Dan; or, The White Savage of the Great Salt Lake: A Terrible Tale of the Danites of Mormon Land(New York, 1878). Walsh, Marie A. My Queen: A Romance of the Great Salt Lake. (New York, 1878). Clark, Charles Heber. The Tragedy of Thompson Dunbar: A Tale of Salt Lake City(Philadelphia, 1879). Paddock, [Cornelia], Mrs. A. G. In the Toils; or, Martyrs of the Latter Days(Chicago, 1879). lark, Charles Heber. The Tragedy of Thompson Dunbar: A Tale of Salt Lake City. (Boston, 1876; Chicago, 1880). Stephens, Mrs. Ann S. Esther: A Story of the Oregon Trail(London, ca. 1880). Paddock, [Cornelia], Mrs. A. G. The Fate of Madame La Tour: A Tale of Great Salt Lake(New York, 1881). Paddock, [Cornelia], Mrs. A. G. Saved at Last from Among the Mormons (Springfield, Ill., 1881). Bartlett, A. Jennie. Elder Northfield's Home; or Sacrificed on the Mormon Altar: A Story of the Blighting Curse of Polygamy(New York, 1882). Gilchrist, Mrs. Rosetta Luce. Apples of Sodom : A Story of Mormon Life(Cleveland, 1883). Ingraham, Prentiss.The Texan's Double; or, the Merciless Shadower. (New York, 1884). Ingraham, Prentiss.War Path Will, the Traitor Guide(New York, 1884). Aiken, Albert W. Old Lynx, the Mormon Detective; or, Saved from a Terrible Fate(New York, 1884). Spencer, William Loring. Salt Lake Fruit: A Latter-day Romance, by an American (Boston, 1884). Lewis, Leon. The Sons of Thunder; or, the Rivals of Ruby Valley ... (New York, 1884). Wheeler, Edward L. Bullion Bret; or, The Giant Grip of Gitthar; A Tale of Silverland (New York, 1884). Aiken, Albert W. Iron Dagger: or, The High Horse in Silver Land: A Tale of Strange Adventures in the Mogollon Country (New York, 1885). Doyle, Arthur Conan. A Study in Scarlet(Primera novela de Sherlock Holmes) (London, 1887; Philadelphia, 1890). Tourgee, Albion Winegar. Button's Inn(Boston, 1887). Hudson, Mary Worrell (Smith).Esther, the Gentile(Topeka, 1888). Kerr, Alvah Milton.Trean, or, The Mormon's Daughter: A Romantic Story of Life Among the Latter-Day Saints. (Chicago, 1889). Mathews, Amelia Veronique. Plural Marriage: The Heart-History of Adele Hersch, by Veronique Petit(2nd edition. Ithaca, New York, 1885). MacKnight, James Arthur. Hagar: A Tale of Mormon Life(New York and Chicago, 1889). Ewing, General Hugh. 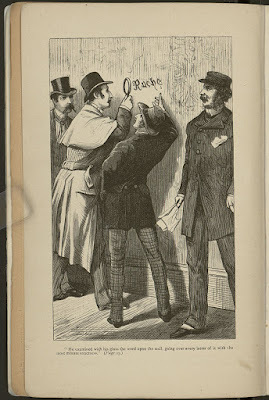 The Black List: A Tale of Early California(New York, 1893). Trout, Grace. A Mormon Wife(Chicago, 1895). Todd, Mrs. Mary Van Lennup. Deborah, The Advanced Woman. (Boston, 1896). Newberry, Fannie E. A Son's Victory: A Story of the Land of the Honey Bee (Philadelphia, 1897). Aiken, Albert W. Gold Dan, or Talbot in Utah(New York, 1898). Gash, Abram Dale.The False Star: A Tale of the Occident. (Chicago, 1899). Dougall, Lily. The Mormon Prophet(New York, 1899; London, 1899).